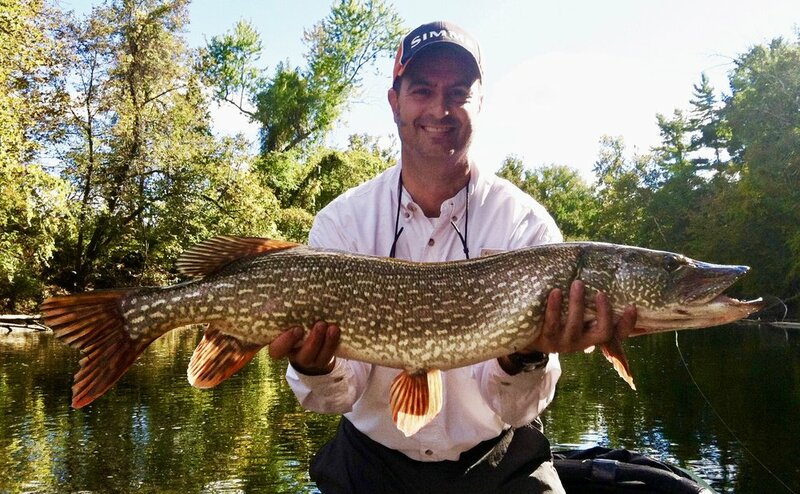 Pogo and his team has a passion for toothy critters fishing for Pike, Musky, Bass on the fly., even Carp on the fly….and teaching from years of experience! Guide Services include full and half days in state of the art Stealthcraft boats. He also offers fly tying lessons, casting lessons, group presentations, sales / business consulting (20+ years in the corporate world) . Areas covered: CT rivers and lakes and most of the Northeast. Also offering fishing for Musky in Wisconsin, the best Musky fishing in North America. Sharing his passion, knowledge, and 'passing it on' is his mission. Pogo is First Aid, CPR Certified, and a Coast Guard Captain, OUPV! Request Rates 1/2 day and full day boat trips. Full day and 1/2 days include drinks and snacks. Top end rods and reels and personally tied flies for specific waters and species fished. Group trips are also available for two boats or more. All levels of anglers welcome. For those who want to sharpen their pike, musky, and bass game I will teach and share as much as I can during our time together on the water. Spin fishing also available. We also offer trips for trout (see Guides section of website). Pre-Trip Checklist - Fishing license, sunglasses, extra layers if needed, rain jacket, and a positive attitude. - it's predator fishing! Be ready to have fun and learn many techniques that took years to master to improve your game! Fly Fishing Musky World Championship Pogo is the current Champion of the 2017 Musky Fly Fishing Championship hosted by Treeland Resorts in Hayward, WI. Pogo and his partner won first place in a two day tournament as well as earning top spot for the biggest fish of the weekend among 57 anglers. Safely Handling Esox Video Below - This Topic Is Near and Dear To My Heart. How to Safely Handle a Pike or Musky After Netting These Beautiful Fish, For Both Your Safety & A Healthy Catch & Release To Preserve the Gentle Fish For Years To Come. I Hope You Enjoy The Video Below!